Dental caries is commonly called tooth decay. Caries in latin is called as ‘rot’ or ‘decay’ and Dental caries means ‘rotten or decayed teeth’. Dental Caries has not been reported in our ancestors in the Pre Neolithic periods (12000 BC) and hence it is called as “Disease of modern civilization“. It is seen that first instance of Dental caries was reported in Skulls examined from Nelithic periods which is 12,000 to 3000 BC from Brachycephalic man. Pithecanthropus or earliest known humans did not show any signs of Caries or carious teeth in the skull. This comes as period before 12,000 BC. Carious teeth were seen more frequently in prehistoric man from 3000 to 750 BC. It is the infection of the tooth which destroys the morphologic and sometimes the physiologic features of the tooth. It is most commonly caused by the acid producing commensal bacteria present in the mouth . The common causes of dental caries is the fermentation of the carbohydrates by the acid producing bacteria which make the environment acidic, this acidic environment damages the dentin and one commensal bacteria produce a adhesive agent (Dextrin) which binds the debris together and binds it to the tooth surface which ends up in Dental Plaque . In general Surface enamel is less susceptible or more resistant to dental caries when compared to subsurface enamel. The Surface enamel is high in mineral content like fluoride, zinc, lead and iron which help in preventing caries. Hypoplastic Enamel, deep narrow occlusal fissures, buccal or lingual pits are predisposing factors to dental caries. 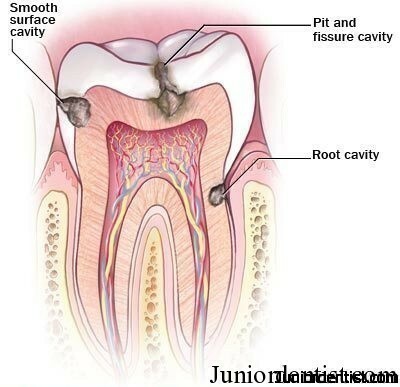 In normal tooth the saliva flow is continuous and tooth is bathed in saliva which helps in remineralizing the early carious lesion which is supersaturatd with Calcium and Phosphorus preventing extension of caries. Attrition: Tooth surface or occlusal surfaces which are attrited loose the surface enamel and the subsurface enamel is exposed which is more prone to caries. Rotated or malaligned tooth: Because of the odd position of the tooth, it makes it difficult to clean all the surfaces of the tooth leading to food impaction which leads to caries formation. Low Saliva or Dry Mouth: In cases where there is decrease in saliva it leads to decrease in pH leading to demineralisation of enamel. Why dental caries are irreversible?